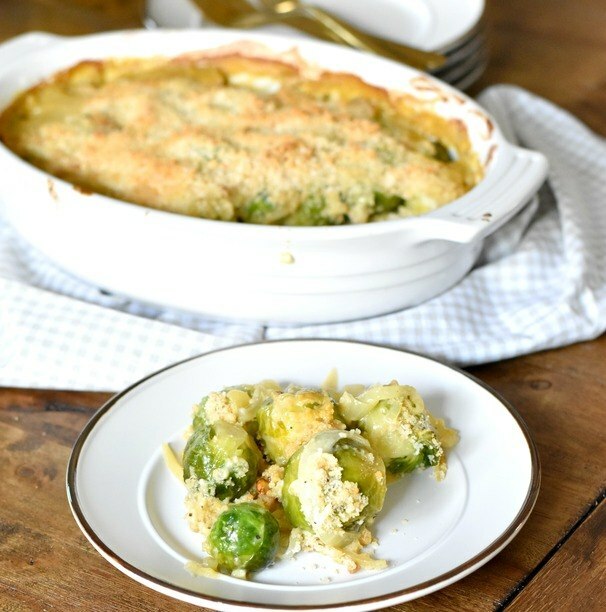 A Vegan Cheesy Brussels Sprout Casserole is the perfect side dish for a family gathering or a holiday. I just recently made it to accompany my Herb Roasted Chicken and it went perfect with it. Brussel Sprouts are a dish that my husband and I enjoy a lot. The kids are not big fans, you know how that goes. I typically make just a regular roasted recipe, but I wanted something a little rich and creamy that would go perfect with a turkey, ham, prime rib, or even a whole roasted chicken. My Uncle would bring a brussels side dish to the holidays. It was super creamy with onions, blue cheese, and bacon. I LOVED it, but its full of gluten and dairy, so of course I needed to make something that we could enjoy now. 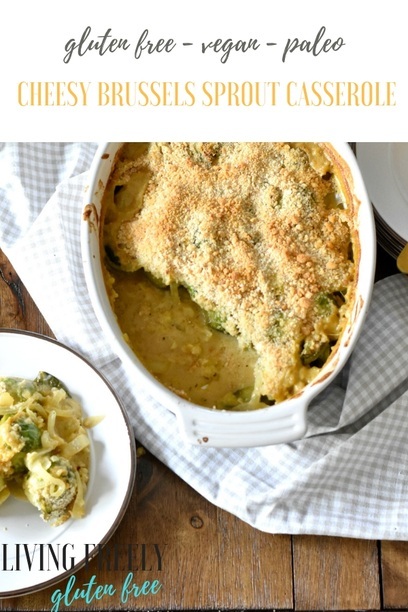 This Vegan Cheesy Brussels Sprout Casserole is rich, with a creamy flavor and an amazing bread crumb topping. Without the bread crumbs this would be paleo. You can totally use almond meal in place of the bread crumbs if you need a vegan and paleo dish. 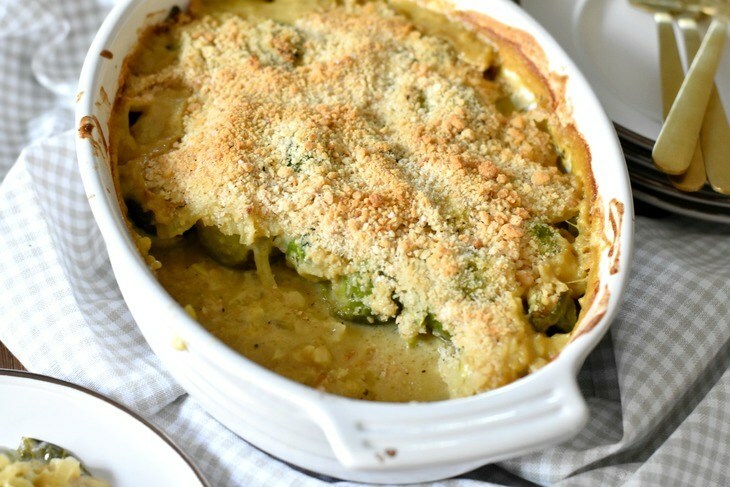 I plan in the future to make another dish similar to this that is less cheesy, but more creamy with some bacon in it, but first I wanted to do this Vegan Cheesy Brussels Sprout Casserole to make it super easy to accomodate multiple food allergies including gluten, dairy, eggs, or vegetetarian. This is the perfect versatile dish you can serve with confidence that your guests will love. 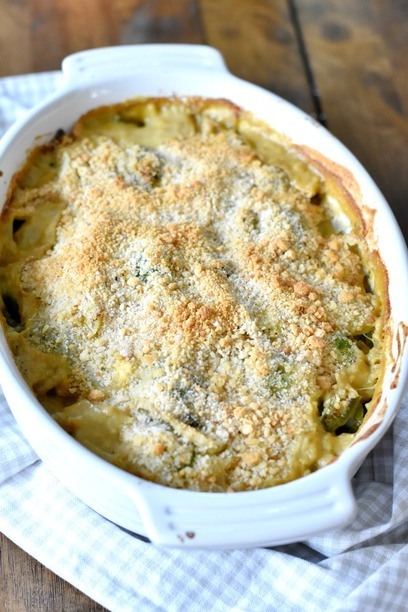 How do I make this Vegan Cheesy Brussels Sprout Casserole egg free? You will love how easy this is to make. First I start by washing and trimming the brussel sprouts. Then I steam them for 10 minutes. While they are cooking I saute the onions and garlic in avocado oil. Spray a cooking dish with non-stick spray. Pour the brussels in the dish and then pour the onions and garlic on top. In the same pan add the coconut cream and broth. Add the seasonings and nutritional yeast. Bring to a simmer. On low heat add tapioca starch and whisk in stirring constantly until it thickens about 4-6 minutes. Preheat the oven to 425ºF. Pour the cheesy mixture on top of the brussels. In a bowl stir together the bread crumbs, salt, granulated garlic, and pepper. Pour the bread crumb mixture on top and bake for 25 minutes. If you want a Paleo version of this dish simply swap out the breadcrumbs for almond meal (not almond flour). 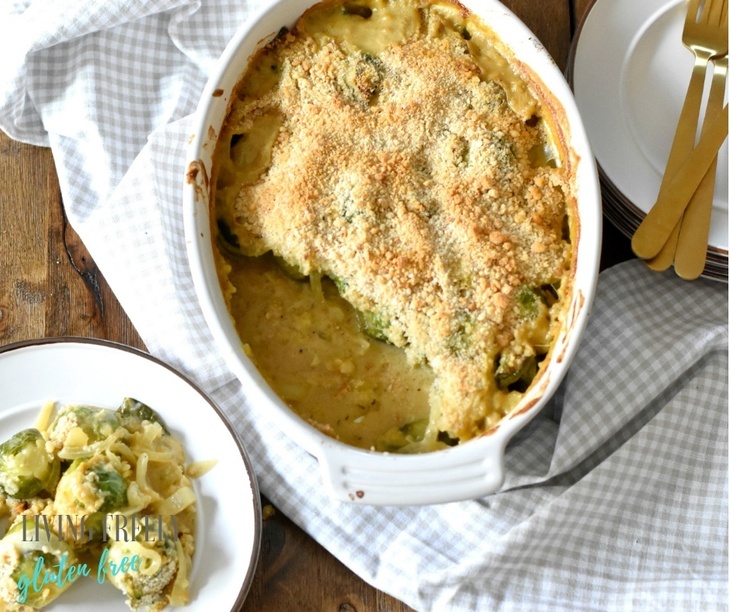 That’s all there is to this cheesy brussels sprout casserole egg free! Make sure to snap a picture and share it with me if you make this dish using the hashtag #livingfreelyglutenfree. Enjoy! These Vegan Cheesy Brussels are gluten free and egg free. Wash and trim brussels and steam them for 10 minutes. Pour into a baking dish that has been sprayed with non stick spray. Saute onions and garlic in avocado oil for about 6 minutes. Pour the onions and garlic on top of the brussels. In the same pan on low heat add the coconut cream and broth, add the nutritional yeast, thyme, paprika, granulated garlic, salt, pepper, onion powder and dash of cayenne. Whisk in the tapioca starch and stir constantly until it begins to slightly thicken (about 4-6 minutes). Pour the cheesy sauce on top of the brussels and onions. In a bowl mix together the bread crumbs, salt, granulated garlic, and pepper. Sprinkle the bread crumbs on top and bake for 25 minutes. Enjoy! Looking for a place where you can ask questions and get support? I have a private Facebook group for this. Head HERE to join. 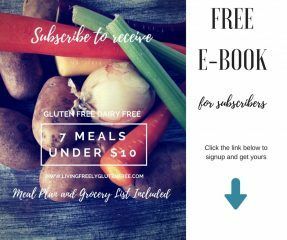 If you like this recipe then you will enjoy my cookbook with over 100 gluten and dairy free recipes that are simple to make with easy to find ingredients. Cheesy lil Brussels. A must have.